Acinos arvensis of Michigan Flora. A native of Europe and especially well established in counties near the Straits of Mackinac, where its preferred calcareous habitat abounds. Collected by the First Survey in Kalamazoo Co. in 1839 but not again gathered in Michigan until 1909–1917, at sites in Emmet and Cheboygan Cos. By the 1950’s it was showing up more commonly, in sandy, gravelly, and rocky clearings, roadsides, fields, and shores; also along trails and railroads. 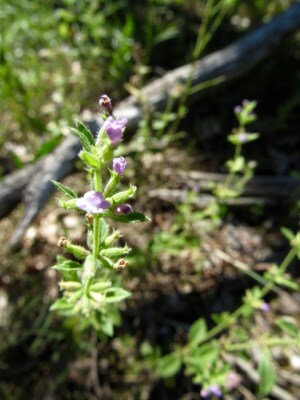 This little blue-flowered annual closely resembles Hedeoma pulegioides, but differs in stamen number (4), larger flowers, and having all 5 calyx lobes ciliate. Hedeoma hispida has all 5 calyx lobes ciliate, but has narrower, entire, sessile leaves. If included in Satureja, this species is called S. acinos (L.) Scheele; also known as Acinos arvensis (Lam.) Dandy. MICHIGAN FLORA ONLINE. A. A. Reznicek, E. G. Voss, & B. S. Walters. February 2011. University of Michigan. Web. April 19, 2019. https://michiganflora.net/species.aspx?id=1531.